On Friday, March 15, Bleary Young Farmers’ Club held their annual table quiz and parents night. 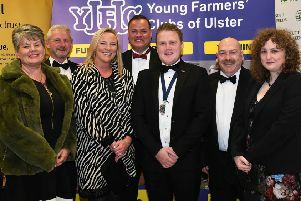 Bleary YFC wish to extend their thanks to all members, family members and friends who attended and supported this event. Thank you also to Tesco, Banbridge for kindly donating a voucher for prizes on the night. Well done to all members for their hard work and dedication throughout 2018/2019 and a special well done to those who picked up awards on the night. The club would like to congratulate all members who received these awards and would also like to wish the incoming committee every success for the incoming year 2019/2020. Senior efficiency awards were awarded to first place Emma Malcomson, second place Zoe Maguire and Amy Richardson and third place Chris Cullen and Sarah Spence. Junior and senior club members through to the county finals include Amy Kinnear and Sarah Spence.